1) I really enjoyed all the food we enjoyed in this class. Specifically, I really loved Roxanna’s risotto and Irene’s spring rolls. They were something unique from them and now we can make them too! 2) I LOVED making our video using our motion photographs. It was really fun and made us into a community that worked together for a common goal. 3) I loved using a class to go to Intuit and hang out with our peers, it was a great opportunity to do something we should continue doing as we behin our careers as teachers. 4) The printmaking workshop Jen and Kent did where we made t-shirts was a ton of fun too. I have always wanted to make a bunch of t-shirts using random ideas I get and now I can. I also got to keep a shirt which will remind me of how much fun we had in this class. 5) The people. I think it’s obvious that the reason we had so much fun in this class is because of Drea and all the students who make up this community. We all had so many informative studios, we had a sense of humor, and we genuinely have bonded as a class. I’m going to miss seeing everyone and getting to be a community when we start student teaching. 6) The video Ali showed that had the slow motion photography with the Cinematic Orchestra song in the background. I love that song, it’s so heartfelt and emotional. Here is the YouTube link for our animated photography! In photography, the term shutter speed represents the amount of time that the shutter remains open when taking a photograph. Along with the aperture of the lens (also called f-stop), the shutter determines the amount of time light exposes the film or sensor. The shutter is similar to a “curtain” located inside the camera that remains closed until you press the button to take a photograph. The bigger the denominator the faster the speed (ie 1/1000 is much faster than 1/30).The pinwheel below is photographed at different shutter speeds, with a faster shutter speed on the left and a slower at the right. Shutter speed is measured in seconds – or in most cases fractions of seconds. In photography, the aperture stop of a photographic lens can be adjusted to control the amount of light reaching the film or image sensor. In combination with variation of shutter speed, the aperture size will regulate the film’s or image sensor’s degree of exposure to light. A simpler way of thinking about the function of the aperture is think about the human eye. Our pupils act just like apertures by letting in just the right amount of light to see. In optics, particularly as it relates to film and photography, the depth of field (DOF) is the portion of a scene that appears acceptably sharp in the image. The depth of field is directly related to the aperture setting. The smaller the number of the aperture gives a shorter depth of field, and the larger the number of the aperture gives a larger depth of field. 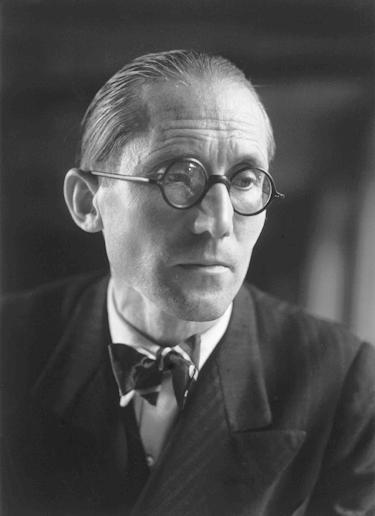 Charles-Édouard Jeanneret-Gris, who chose to be known as Le Corbusier (French pronunciation: [lə kɔʁbyzje]; October 6, 1887 – August 27, 1965), was a Swiss architect, designer, urbanist, writer and painter, famous for being one of the pioneers of what now is called Modern architecture or the International style. He was born in Switzerland and became a French citizen in his thirties. He was a pioneer in studies of modern high design and was dedicated to providing better living conditions for the residents of crowded cities. Later commentators have criticized Le Corbusier’s monoliths as soulless and expressive of his arrogance in pioneering his form of architecture. His career spanned five decades, with his buildings constructed throughout central Europe, India, Russia, and one each in North and South America. He was also an urban planner, painter, sculptor, writer, and modern furniture designer. Le Corbusier adopted his pseudonym in the 1920s, allegedly deriving it in part from the name of a distant ancestor, “Lecorbésier.” However, it appears to have been an earlier (and somewhat unkind) nickname, which he simply decided to keep. It stems from the French for “the crow-like one”. In the absence of a first name, some have also suggested it suggests “a physical force as much as a human being,” and brings to mind the French verb courber, to bend. Les 5 Points d’ une architecture nouvelle, which Le Corbusier finally formulated in 1926 included (1) the pilotis elevating the mass off the ground, (2) the free plan, achieved through the separation of the load-bearing columns from the walls subdividing the space, (3) the free facade, the corollary of the free plan in the vertical plane, (4) the long horizontal sliding window and finally (5) the roof garden, restoring, supposedly, the area of ground covered by the house. These points were illustrated best in Le Corbusier’s domestic architecture. Le Corbusier’s first attempt to deal with the problem of mass housing was Maisons Citrohan, designed in 1920-22. All parts of the house are united by a spatial continuum, while the open space created by the pilotis and the flat roof increase the otherwise small available area. The prototype of a single-family unit, which was later modified to a module within a collective building, for example the basic units of the Immeuble-villa (1922). Le Corbusier established his concept of the dwelling as standardized, mass produced and serviceable like the modern car. Citrohan 2 implies the elements of the Dom-Ino constructural system, that is the use of a reinforced concrete frame. Citrohan 2 introduced ideas of Le Corbusier’s ‘5 Points of New Architecture’: the building raised off the ground on pilotis, which ‘free’ the ground for vehicular circulation and for services. The roof-garden or terrace, which is clearly established in the Citrohan projects as a component of private, domestic space.